Once you are ready to fret a string it is important to remember to use the very tip of your finger and be sure to arch your fingers so that they don’t catch other string beneath them. It is also important to remember that you only need press the string down with enough pressure to get a note to sound and not to press down too hard otherwise you may hurt your fingers and put the note you are playing out of tune. 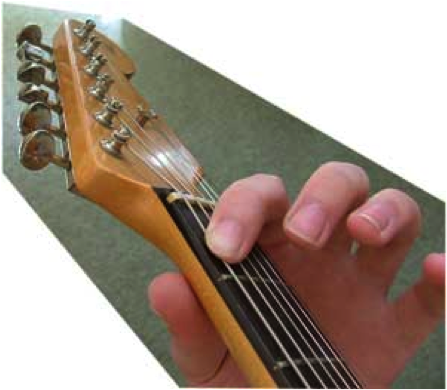 In this image you can see that the string is being pressed down with the tip of the finger and that the finger has arched over the other strings. Also it is important that you press the string down as close to the metal fret wire as you can without touching the wire in order to get a nice clear note.